Using a content management system is a very easy and accessible way for creating and maintaining a website. More than half of Internet sites are using CMS in order to alter and update content. About 51% of them are based on WordPress, which makes it a webmaster’s best choice. In the next few paragraphs, you will find out more on its advantages and what you can achieve with WordPress. What are the advantages of WordPress as website building platform? It doesn’t matter if you’re using WordPress to create a corporate website or an informational webpage – its strong sides will make you count on it. Apart from having a user-friendly interface, it will allow you to easily manage your website, even without having programming skills. Additionally, it is also suitable for users with advanced web programming skills. A well-known fact is that WordPress is free to use, in addition to being open source. This allows programmers to check the its source code and to create plug-ins that build up on its functionalities. The functions of WP provide you with look even more infinite when you include all free and premium plug-ins you want. They give you the ability to combine a huge variety of additional perks to your website. You can choose from over 46 000 different plug-ins. Whichever theme you pick, your site can have an original and unique design, suitable for your brand’s characteristics. The platform allows you to install and remove different themes, as well as to quickly find the right ones. With a couple of clicks, you can change the whole look of your web page. With WordPress you can create websites without any programming skills by conveniently using a Page Builder – an ordinary plug-in with extraordinary powers. With its help, you can give your blog or business website the creative and sophisticated look you always wanted. You can also place texts, images, counters, maps – it is as easy as a child’s play. If you are interested in search engine optimization, you probably know that this particular CMS is SEO-friendly. Usually, the users make a few mistakes when it comes to WordPress SEO, but it doesn’t mean that with some additional effort, your website won’t reach first place in Google. You have to consider some few requirements, then to optimize your content with plug-ins like Yoast SEO for WordPress and the result will surprise you. WordPress isn’t a lone warrior on the CMS battlefield. Actually, its main competitors are platforms like Joomla and Drupal, which don’t outperform WordPress’ convenience and functionality. Many people also consider the strengths and drawback of said two platforms, when they have decide which CMS they should choose. While WordPress is suitable for all beginner webmasters, Joomla requires at least basic technical knowledge. On the other hand, Drupal welcomes only those who are familiar with HTML&CSS or PHP. That makes the two inefficient for people with an idea, who are looking for a fast and easy way to start. To compensate the lack of a certain functionality in WordPress, you don’t have to do anything else than find the right plugin for you. Speaking about Drupal we cannot miss the fact that it’s the most complicated CMS of them all. The quality and the customization options, which the system provides, are certain. However, its complexity is what drives away the typical users – something that our favorite open-source CMS perfectly monetizes on. People often see Joomla as a crossover between Drupal and WordPress. The skills for managing your content in Joomla are not as big as the ones in Drupal. Your skills, however, have to be more extensive than, those for WP. That means, that if you want to pass the coding step, you can directly use WordPress. We cannot deny each of these three popular platforms has its bright sides. Joomla is well-known as a good way to create social network – but if you didn’t take this opportunity a few years ago, you probably missed the boat. Drupal, on the other hand, is one of the favorite for many advanced coders, because it is flexible and powerful. WordPress remains, however, the most popular platform since it combines all traits from the other ones and can be a suitable choice for everyone. Many of the biggest online names have taken into account all advantages of WordPress and actively use it – CNN, BBC America, The New York Times, MTV News, TED, Variety and etc. A proof of its widespread usage are other companies like Sony Music and Xerox. Like those well-known corporations, more than 15 886 000 websites have trusted WordPress. 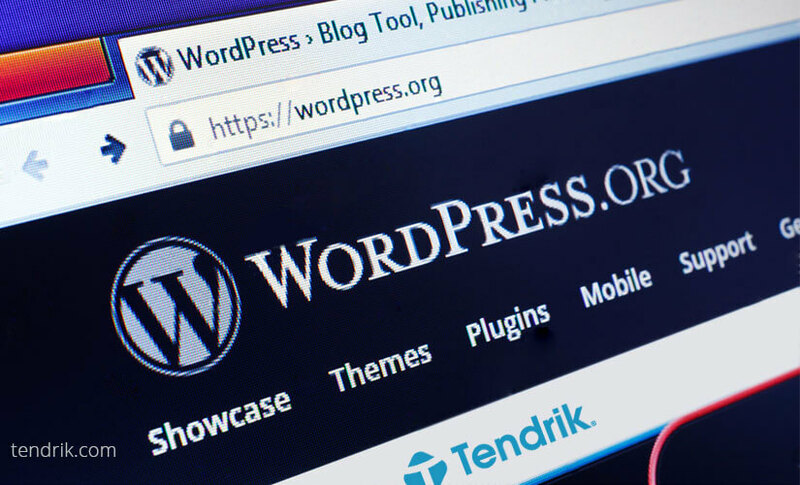 That’s why Tendrik strongly believes that WordPress is the right foundation for creating a blog or building a business website. If you need a new professional and stylish online image for your customers – contact us!